The last few weeks have been hard. Really hard. My life has gone and turned upside down in so many different ways and I've been left feeling like an absolute failure. I'm struggling to find my way again after a total derailment. The good news is that while my head is all over the place, I'm still finding plenty that brings me joy, including the links below. In this time of tumult and uncertainty, I'm glad I can still find beauty in the world...and that's part of the essence of me that I'm so glad has remained: an ability to always find inspiration, even when a dark cloud hangs over so much. I'm adding each of the world's most glorious waterfalls to my bucket list! The kid in me loves carnivals (okay, mainly for the cotton candy and funnel cakes and lemon shake-ups), but these incredible balloon animals take it to a whole new level. I am head over heels smitten with the work of this photographer. I'm definitely NOT on the Pokemon GO bandwagon, but this article about discovering an appreciation for where you live through the app really speaks to the cultural geographer I trained to be. The Scandinavian artists are at it again and I'm OBSESSING. I really lovely little read by Anna Quindlen on a short guide to a happy life. Do you ever experience this physical phenomena from art or music? I do! In case you didn't already know how cool the Notorious RBG is, here's a brief run-down on Ruth Bader Ginsberg in all of her awesomeness. I'm always adding to and cultivating my array of art. I'm totally using this guide Domino recently posted about how to start an art collection from scratch for more ideas and styling tips. In my opinion, a home full of art is a home full of personality. I'm obviously biased, but what better time to curl up and read than winter? My ideal scene is a cozy fire, a warm kitty on my lap, freshly-brewed tea in one hand and a delicious book in the other. Old Punxsutawney Phil was out for a minute yesterday and they're claiming it will be an early spring, but we all know how it will really go, at least here in old Chi Town City. This is exactly why I've collected a sampling of books I am either planning on reading, just added to my @Goodreads To-Read account, or are due to be released and I'm excited to check out this month. I'd love to hear about what you're planning to read for February and beyond. Let me know and Happy reading! I am so pumped for the release of this book because Muriel Barbery is one of the finest authors I've ever read. Her last novel, The Elegance of the Hedgehog, remains one of my favorite books of all time. Maria lives in a remote village in Burgundy, where she learns that she has a gift for communicating with nature. Hundreds of miles away in Italy, Clara discovers that she possesses a stunning musical genius and is sent from the countryside to Rome to develop her preternatural abilities. Barbery’s The Life of Elves tells the story of two children whose extraordinary talents will bring them into contact with magical worlds and malevolent forces. If, against all odds, they can be brought together, their meeting may shape the course of history. Perhaps more "emotional" than books I'm typically drawn to, this book still looks exceptionally memorable. The Heart takes place over the twenty-four hours surrounding a fatal accident and a resulting heart transplant as life is taken from a young man and given to a woman close to death. In gorgeous, ruminative prose it examines the deepest feelings of everyone involved--grieving parents, hardworking doctors and nurses--as they navigate decisions of life and death. As stylistically audacious as it is emotionally explosive, Maylis de Kerangal's The Heart has mesmerized readers in France, where it has been hailed as the breakthrough work of a new literary star. This book has been getting a lot of attention lately, so I'm intrigued. I tend to shy away from books that are getting a lot of hype, but am trying to overcome that tendency because I almost missed out on some excellent books because of it (um, Hi Girl With The Dragon Tattoo, I'm looking at you)! When Breath Becomes Air chronicles Kalanithi’s transformation from a naïve medical student “possessed,” as he wrote, “by the question of what, given that all organisms die, makes a virtuous and meaningful life” into a neurosurgeon at Stanford working in the brain, the most critical place for human identity, and finally into a patient and new father confronting his own mortality. This could not be more up my alley! I love cephalopods, am fascinated by neuroscience, and am always drawn to books on nature. Bing Bang BOOM. I'm especially excited to read this one. The intelligence of dogs, birds, and chimpanzees was only recently accepted by scientists, who now are establishing the intelligence of the octopus, watching them solve problems and deciphering the meaning of their color-changing camouflage techniques. Montgomery chronicles this growing appreciation of the octopus, but also tells a love story. By turns funny, entertaining, touching, and profound, The Soul of an Octopus reveals what octopuses can teach us about consciousness and the meeting of two very different minds. Another book that contains some neurosciencey stuff, I just can't resist. Perhaps it will be an enlightening look into my own crazy complicated creative mind! Based on psychologist Scott Barry Kaufman’s groundbreaking research and Carolyn Gregoire’s popular article in the Huffington Post, Wired to Create offers a glimpse inside the “messy minds” of highly creative people. Revealing the latest findings in neuroscience and psychology, along with engaging examples of artists and innovators throughout history, the book shines a light on the practices and habits of mind that promote creative thinking. Kaufman and Gregoire untangle a series of paradoxes— like mindfulness and daydreaming, seriousness and play, openness and sensitivity, and solitude and collaboration – to show that it is by embracing our own contradictions that we are able to tap into our deepest creativity. All I can say is YES. This brilliant, hilarious, and practical parody of Marie Kondo's bestseller The Life-Changing Magic of Tidying Up explains how to rid yourself of unwanted obligations, shame, and guilt--and give your f*cks instead to people and things that make you happy. I can't wait to hear about your own books and recommendations! Thank goodness I moved onto The Girl With All The Gifts by M.R. Carey after my last literary disappointment. Talk about a total 360 turn-around! I simply devoured the book and have been recommending it to anyone who will listen to me jabber on about it! Can you guess what it's about? I bet you'll be surprised! No cheating!! Click this link to check out my @goodreads review and definitely make sure to pick up your own copy! Right after finishing The Girl With All The Gifts I decided to check out the most recent book I'd ordered, StrengthsFinder2.0 by Tom Rath. Now, I don't normally find myself drawn to self-improvement-y books, but I decided to give this one a shot. A small business owner I know recommended it and I figured she's pretty put-together so she must know what she's talking about and besides, it can't hurt, right?! Anyhoooo, I didn't even write a review for it on my Goodreads account because it's almost not worth it. Turns out the book is more of a glorified password to take the StrengthsFinder online assessment and is almost totally unnecessary beyond that (literally. You have to rip apart sealed pages in the very back to access a code so you can take the quiz online). I'll keep it around for future reference needs and I found the info inside moderately interesting, so I'm not too bothered that I spent the money on it, but if that's not your M.O. I'd say probably skip purchasing it. I think what I did like about it is that it's kind of like the Meyer's Briggs personality test, but with directions on how to apply it to your personal and professional life. While it was not as enlightening by any means as the M.B. Test, it was still accurate enough for me to find it pleasant to read into. I'm curious to find out my loved ones' strengths, and for that reason I'm hanging onto the book. I'm already about halfway into my next novel. Can you guess what I'm reading now? Stay tuned to find out! Hope your weekend is grand! Anyhoo, check out the book below! I've attached the book's description via @Goodreads (which, if you aren't a member, make sure to sign up and add me!). A link to my review is below as well. Let's just say, it might not be what you expect! From flying squirrels to grizzly bears, and from torpid turtles to insects with antifreeze, the animal kingdom relies on some staggering evolutionary innovations to survive winter. Unlike their human counterparts, who must alter the environment to accommodate physical limitations, animals are adaptable to an amazing range of conditions. 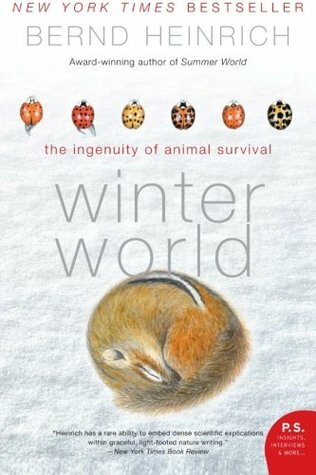 Examining everything from food sources in the extremely barren winter land-scape to the chemical composition that allows certain creatures to survive, Heinrich's Winter World awakens the largely undiscovered mysteries by which nature sustains herself through winter's harsh, cruel exigencies. check out my review here! friend me on @Goodreads here! I'm an artist, an explorer. A book reader, a tea drinker. A star gazer, an animal lover. An admirer of colorful things. A Colorado girl homesick for the mountains. Finding joy in the details of every day. Hello + Welcome to my blog! Stay Inspired! Sign up for blog updates that will make you want to check your inbox! Thank you for subscribing! You are now an official member of the coolest club around! Share book reviews and ratings with Britta, and even join a book club on Goodreads. Stay up-to-date on the latest blog posts, news, and be the first to know about new products! Copyright © 2005 - 2016, Britta Loucas. © Bert & Lou blog. All rights reserved. Sharing of information from this site is acceptable for non-commercial purposes provided that proper crediting links are included. No PDF downloads or full tutorial content may be distributed without written permission. Unauthorized use and/or duplication of any of my original designs and/or photos is strictly prohibited. Excerpts and links may be used, provided that full and clear credit is given to BertandLou, Bert&Lou USA and/or a specified product and all content must be original. All images and content are the sole property of Bert&Lou. All Rights Reserved 2016. ©Bertandlou.